ICanServe Foundation and Swatch collaborate this October to raise breast cancer awareness with the ICanServe Philippines watch by Swatch. 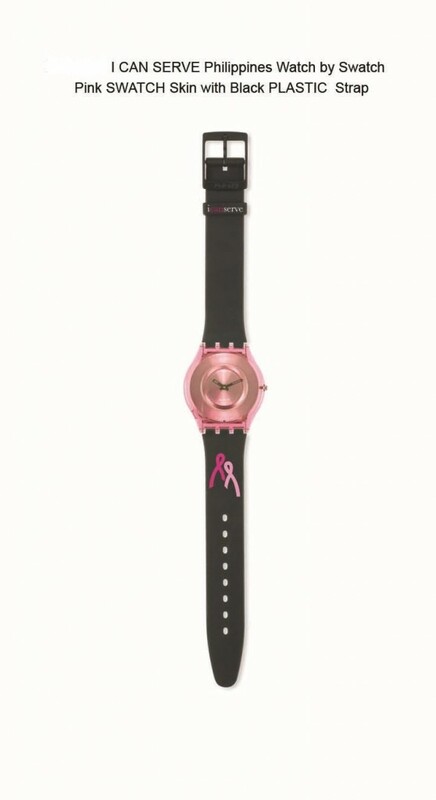 Available from October 14 until supplies last, the ICanServe watch features a pink Swatch skin with black plastic strap. A portion of sales will go to ICanServe programs that favor women at risk for or living with breast cancer. ICanServe advocates early breast cancer detection through screening programs that train community health workers in clinical breast examination. It embarks on high impact information campaigns to spread hope and dispel fear. The ICanServe watch by Swatch retails at P5,000 each. Available in all Swatch outlets in Manila (from October 14), Cebu (from October 15) and Davao (from October 17), it will also be carried at the ICanServe weekend space in Power Plant Mall, Rockwell Center Makati all Fridays, Saturdays and Sundays of October.